The SUP School was created in 2012 by Isabelle Malique-Park, a certified Stand Up Paddle Instructor (Academy of Surfing Instructors) and Life Saver. The School is the first in Asia to become ASI accredited and the only ASI SUP School in Singapore. 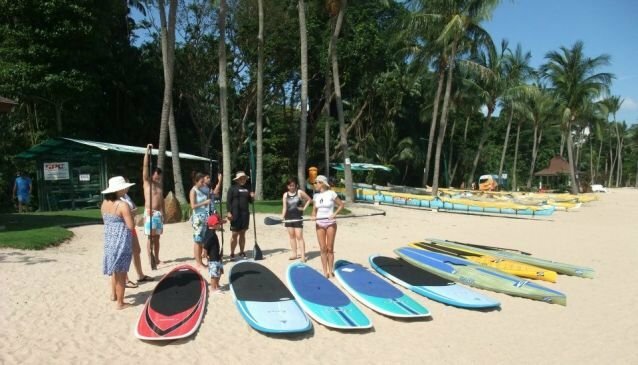 Based on Tanjong Beach They offer a full range of Stand Up Paddle activities - SUP rental, SUP beginner and advanced classes, SUP fitness/yoga/pilates, SUP eco-tours and SUP teambuilding. It is safe and easy to learn, and Singapore is the perfect location, thanks to its calm, warm waters and endless summer. The practice of SUP is excellent for core training and fitness, rehabilitation, even yoga and pilates on water. Learning the fundamentals of SUP helps performance in other water sports, including windsurfing, surfing, wakeboarding and dragon boating. It will definitely help you increase your stamina, balance and strength.